Victorious Festival is a family friendly festival which takes place on the Friday, Saturday and Sunday of the August Bank Holiday. The festival has grown into the UK's largest inner city festival, the event caters for the whole family across 9 stages, Victorious includes, a real ale and food festival, a huge children’s arena, markets, the Historic Dockyard attractions, DJs, a Silent Disco, and plenty of indoor entertainment just in case the great British summer turns up to wash them out! 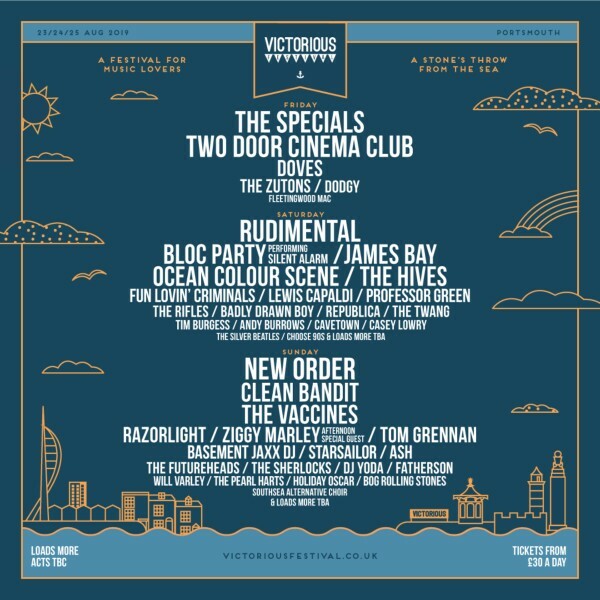 The festival hosts some of the biggest artists from the UK and beyond, previous bands to perform at Victorious include The Prodigy, Paul Weller, The Libertines, The Manic Street Preachers, Noel Gallagher's High Flying Birds, Primal Scream, The Flaming Lips, Dizzee Rascal, Basement Jaxx to name but a few. Festival goers treated to an acoustic arena carpeted in fake grass and scattered with sea side deck chairs, an alcohol free children’s area, street entertainers, boutique and creative markets and plenty of local produce food stalls to choose from.